Gymnastics is one of the most versatile sports in the world. The Gymnastics curriculum offers children a multitude of life enhancing benefits and will prepare them for a lifetime of success. While they are building motor skills, they will also show improvement in social and intellectual skills. 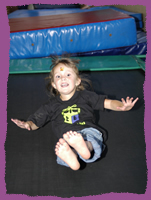 The children will increase flexibility, balance and rhythm, and consequently improve self-esteem, and confidence. Listening skills, attention span and the ability to follow directions will improve. Finally, they will become more confident, more willing to take risks, and challenge themselves in ways they never have before. What makes Tiny Tumbles differ from the other programs is the utilization of Education through Gymnastics as a basis for all classes? Our classes teach kids the importance of discipline, structure and fun movement.